I originally wrote this review in February 2014 for ThEpic Review. Ah man I LOVE this one! The first one is still my favorite, but this one holds a special place in my heart. Pantasm always will, i think. The whole series! I really want to sit down and watch all of these again, now. They're so frigging fun! Did you see John Dies at the End? It's directed by Coscarelli and while it's based on a book, it really has the bizarre, anything could happen feel of Phantasm. I haven't, but I was interested in it. I saw it listed on netflix, last time I shuffled through, so I'll have to give that a watch! 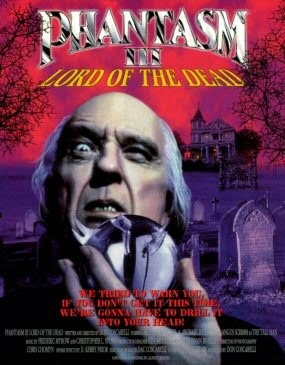 The Phantasm series is seriously underrated. Sure it's pretty cheesy, but I love that they've maintained a continuous story throughout the sequels. I'm just hoping the 5th (and supposedly last) movie gets released soon. I looked into this and saw that it's apparently just waiting for a distributor. Hopefully this gets resolved soon. The world needs more Phantasm!